The documented case for treason in Jane Fonda’s 1972 visit to Hanoi — including her pose with an anti-aircraft gun used to shoot down American planes, and propaganda broadcasts toward U.S. troops. “Axis Sally, Tokyo Rose, Lord Haw Haw — all of whom were punished as traitors — would have been amazed to read Aid and Comfort: Jane Fonda in North Vietnam. The sum for their acts of treason equals a small fraction of the acts of aid and comfort Jane Fonda gave our Communist enemies. “Unmasking Jane Fonda. This book should be read by everyone — like myself — who, at one time, felt that Jane Fonda was an American idol. “The revelations described here, with irrefutable primary source evidence, will convince even the most diehard supporters that Jane Fonda committed treason as defined by the U.S. Constitution. “Instead of being deified by women's groups and opponents of the Vietnam War (of which I number myself), Fonda should be indicted for treason. “Finally! ... A superbly written and seriously scholarly book ... based on a foundation of thorough legal analysis of documented events — for formulating what amounts to an indictment of the behavior of a traitor. “There is no statute of limitations on treason. And there’s no good reason why Jane Fonda escaped it. Thirty years is nothing. The law is there for a reason. Jane Fonda’s visit to Hanoi in July 1972 and her pro–North Vietnamese, anti–American conduct, especially her pose with an anti-aircraft gun used to shoot down American planes and her propaganda broadcasts directed toward American troops, angered many Americans. In their eyes, she was guilty of treason, but she was never charged by the American legal system. Instead, she has made millions, been the recipient of countless awards, and remained an honored American icon. This work investigates Fonda’s activities in North Vietnam and argues that she could have been indicted for treason, that there would have been enough evidence to take the case to a jury, that she could have been convicted, and that a conviction probably would have been upheld on appeal. 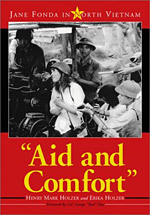 It also considers Fonda’s early life and the effect it had on her behavior and beliefs in her later years, her audience of American POWs who were forced by the Vietnamese to listen to her broadcasts condemning them as war criminals, her arrival in Vietnam and how it was viewed by American servicemen and civilians, the crime of treason throughout history, and the only Congressional inquiry into her actions, which resulted in the government’s decision to take no legal action against her. Texts of Fonda’s radio broadcasts to American servicemen comprise the appendix.